Except for the fact that we wanted to get away and we didn’t feel like mingling in crowds, let alone the holiday madness. Our first plan was to head to Portugal with our rooftop tent. There would be a chance the distance wouldn’t allow us to reach Portugal, but the area between Saragossa and Madrid seemed perfect to discover some inhospitable environments. Last summer we explored Sweden and Norway for five weeks. Especially what we saw in Sweden made us curious for the country during winter. Different opinions made their way to us: from “a dark and cold, depressing winter hole” to a “fairytale winter wonderland”. Being as impulsive as we are, we took our chances and assumed the latter. We contacted a nice local couple we met: the owners of the natural camping site “Wildlife Sweden” - where we spent a couple of days last summer – and with whom we had a very nice encounter. Besides their small scale camping site, they also transformed an old school building into two Airbnb’s. We asked them if we could stay there from December 24 until January 2. Camping wasn’t an option. 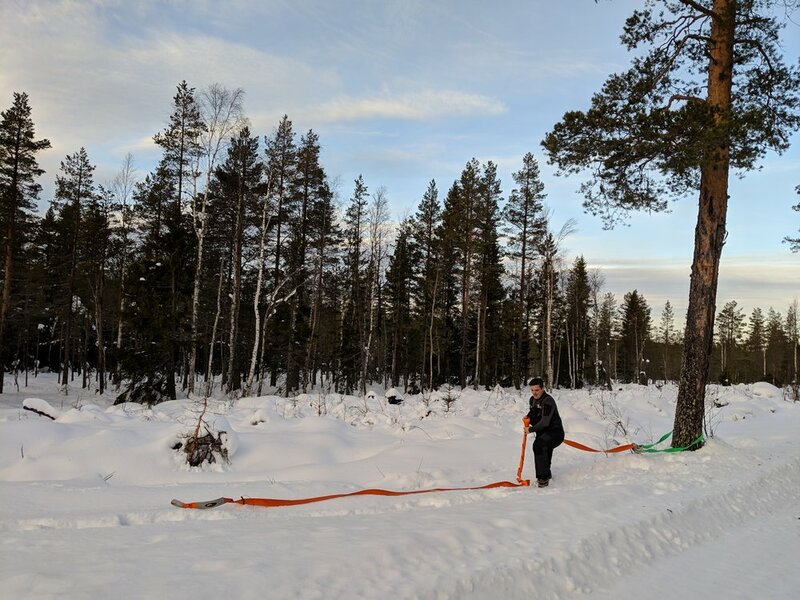 At this time of year temperatures dropped to minus 15 degrees Celsius – a bit below my personal freezing point… Soon we got a positive reaction to our request. Ecstatic with joy we could start packing. Done planning! Our first stop, in Denmark, was the same as last summer – which will be our regular stop in the future as well. And of course I couldn’t resist crossing the Øresund bridge, although the bridge was covered in fog this time. The second stop was a beautiful cottage at the banks of the Vättern lake, in the village of Vadstena (on the map: D). The cottage had only one room and a shared kitchen, but there were no other guests, not even on our way back. On our way up, all of Southern Sweden was covered in a thin layer of snow. 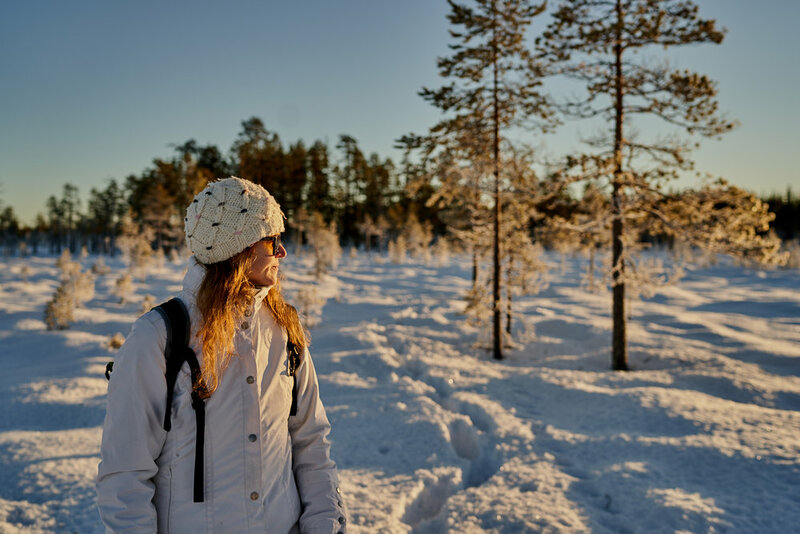 On the way back all that snow was gone, but as I learned from the locals, winter doesn’t hit Sweden before the end of December or early January. Luckily being on the road feels as much as travelling to us as being at our destination. 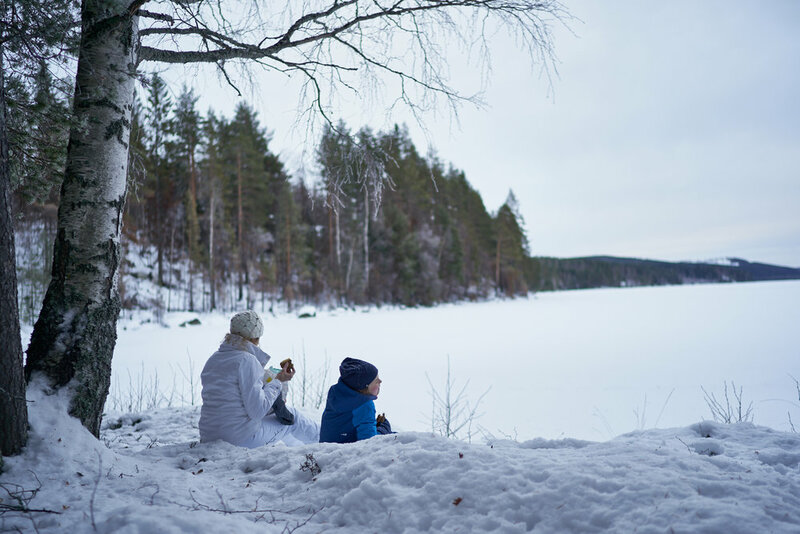 And our kids are - more or less – quiet enough to easily drive 700 kilometers with just a single 20-minute stop to eat. Something which does require a great deal of preparation and in-car entertainment. But I’m proud to declare ourselves well-prepared, especially after spending about 10.000 kilometers in the car for the past year. 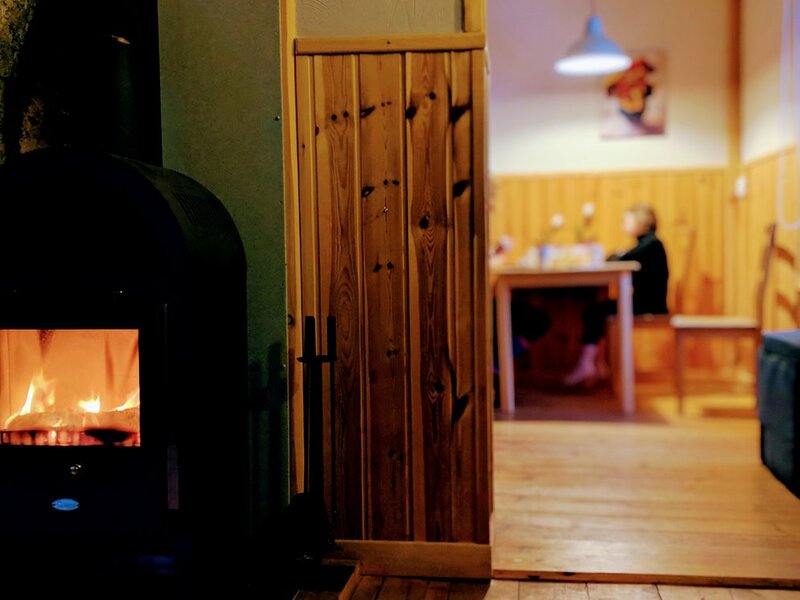 After a very happy reunion, we settled down in the incredibly cozy cottage where the stove was already burning. Such a stove immediately adds value to the atmosphere, by the way. The first thing I did in the morning was lighting up the thing – I would even get out of bed in the middle of the night to throw on some extra wood. The warmth and dancing flames were just lovely. ‘Wildlife Sweden’ is located in Ängra. Or better: ‘Wildlife Sweden’ is Ängra, because the village is nothing more than Marco and Aafke’s house, the old school building and some sheds. And that’s it, there’s nothing else to discover for miles. Fine by us! 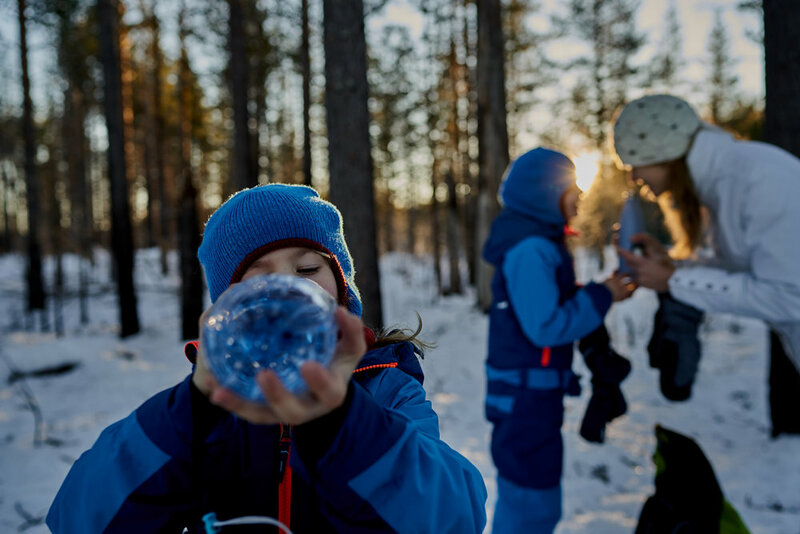 We started our stay with catching a breath for a day or two, exploring the environment, giving our daughters the chance to get loose after sitting in the car for three days and letting them plunge face-first in the snow. They had no trouble having fun on their own, which gave us the chance to kick back. I’m not really the kind of guy to embark on some organized adventure. I prefer to embark on and make my own adventures. But as it happens, there are some things you can’t organize on your own. Especially in a country you don’t know during a season you shouldn’t underestimate. Most of the time, I think organized trips are over-organized and over-sold. It always feels like you’re guided into some gaudy adventure. But Ängra didn’t have a tourist information center or some travel agent’s desk. The nearest store was a 60 kilometer drive away. So if you wander into a nearby forest looking for whatever, you know your adventure is going to be a real one. Fortunately, Marco is an expert when it comes to adventures. He truly lives for the Swedish nature. That’s why he organizes some adventurous activities himself or why he’ll send you to some neighbours who’ll help you experience Sweden as well. If you know me a bit, you’ll also know I’m quite skeptic when it comes to this kind of stuff. But I honestly enjoyed every adventure that was offered to us. Finding the right balance between organized trips and exploring the country on our own, also helped. One of our absolute highlights was a hike through the Hamra National Park - a huge ancient forest, just an hour away from our school building-turned-cottage. We planned to go for a 12 kilometer hike, a combination of two trails. The drive to the National Park alone was already mesmerising. The hike took us across a frozen swamp and little islands of bits of forest. Stunningly beautiful. I can’t find the words to describe how amazing the vast landscape was and how intense the entire experience felt. The silence, the quiet, the light, the loneliness,… the only sound we heard came from the snow crunching beneath our feet and our breathing. I would throw one superlative at you after the other. So please, let these pictures speak for themselves. We climbed through trees and on rocks and crossed swamps or lakes, only to arrive back at another little islands of trees and rocks. The low hanging sun spread its warm, bright glow across the landscape – with its beams touching the treetops. We truly felt like we were the only people on the planet. It felt so powerful. Lucky for us, someone embarked on the same hike, just one day before we did. This meant we could still make some progress, stepping in the footprints of that person’s snowshoes. Halfway the hike, that trail went the opposite way. We decided this was the ideal opportunity to have lunch and discuss our next move. We walked 2 kilometers during the past hour and a half. During summer that would’ve been nothing. But during winter, in the snow, without snowshoes, this was quite the achievement. Especially for our girls. Every step we had to lift our feet for 50 centimeters, only to disappear in the snow again. After we had sandwiches, coffee and tea, we decided to try our luck and continue. The trail we were on would turn around and was only 5 kilometers long. Which meant we could end this hike before dark – at 3 p.m. We would drop the second part of the hike. But after 100 meters in the snow, without any footprints of previous hikers guiding us, we all were out of breath. I looked on my watch and we were only walking for 30 minutes. “This is going nowhere”. Taking into account the fact we didn’t feel like hiking in the dark and we had just reached the halfway point, we decided to turn around and follow back our own steps. A kind of decision we’re not accustomed to. But given the circumstances this seemed the best and wisest decision. Lesson learned and snowshoes added to the packing list! Those who know me, realize there are a few things in life I absolutely can’t empathize with. Fishing would be a perfect example. The only reference I got are elderly men spending their Saturday or Sunday at a fishing pond, sporting high-tech equipment and chugging beers. When their fishing line beeps, they reel in the fish, throw their line out again and open another beer. Sometimes they’re joined by their wife, who sits on a stool – a few meters behind her husband – or sometimes would even wait in the car. Fishing is sadness. So I wasn’t particularly looking forward to go fishing, but Marco knew how to sell it to me. “Niko, we hop on the snowmobile, drive through the forest towards the lake, we go ice fishing, light a fire, roast some sausages and have some toast”. I sat on the snowmobile before Marco could finish his sentence! 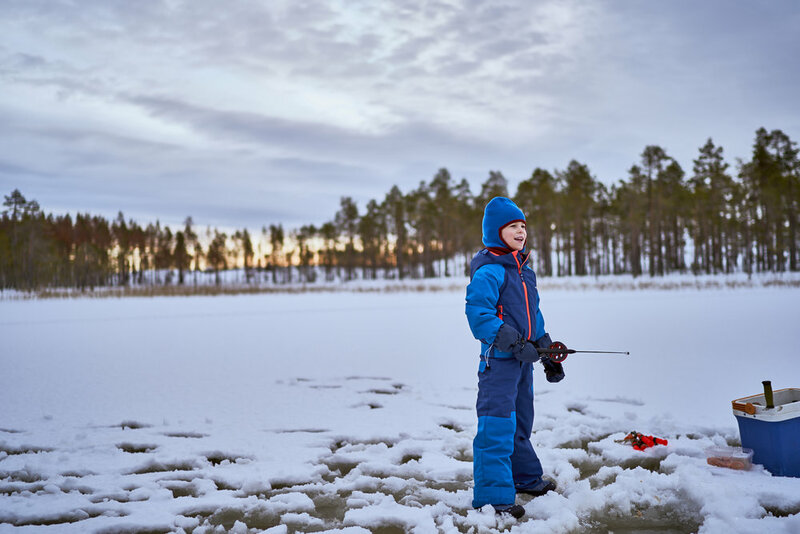 In the end, the ice fishing was a really nice experience as well. One of my biggest fears is having to see one of my daughters fall through the ice and not being able to reach her. But the Swedish ice was so thick, I could easily set aside this fear. On top of that, Marco had the right rescue equipment with him. I was reassured. 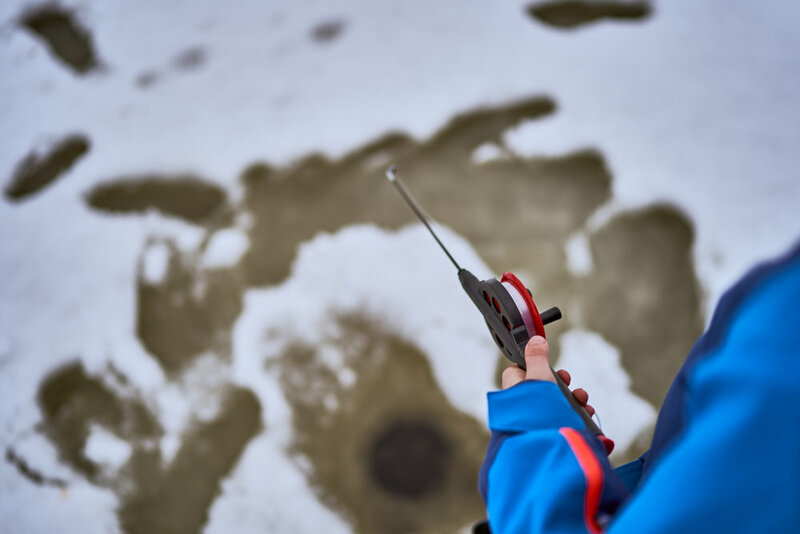 So we drilled a hole in the ice and waited. Since we had two hyperactive puppies – my daughters – with us, I think all the fish were alarmed even before we set foot on the ice. We didn’t catch a single one. I also believe fish aren’t as stupid as they look, ‘cause you could feel them nibble on the bait. All we did was serve them lunch! But fish or no fish, I’m glad we spent that time at the middle of the frozen lake with a tiny fishing line in the water. I’m definitely going to do this again, but not after I dropped the kids in the Ikea ball pool in Stockholm. More chance to catch fish, that way! We closed off the day with a fire and some toast. I could live like this! 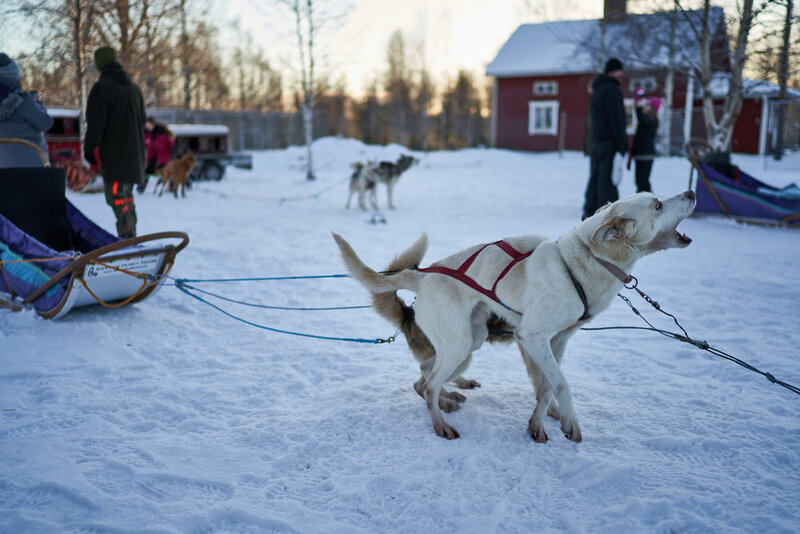 Another amazing highlight of our trip – something that surpassed my expectations – was the husky sleigh ride. Something you’ve seen before in movies, magazines and books, but those reports don’t even come close to the real life experience. We got initiated into the world of husky sleigh rides by one of our neighbors (only 20 kilometers away). The people who took us for a ride got 62 dogs and take care of them, on their own, every day, seven days a week, 365 days a year. Marco told me this life is a real calling. These people really live for and with their dogs. And those dogs… oh boy… the entire bunch had some form of hyperactive ADD. Especially when getting ready for the ride. Barking, jumping, howling, rolling,… you can’t imagine the noise and activity. You can sense their excitement, longing for the moment they can start running. 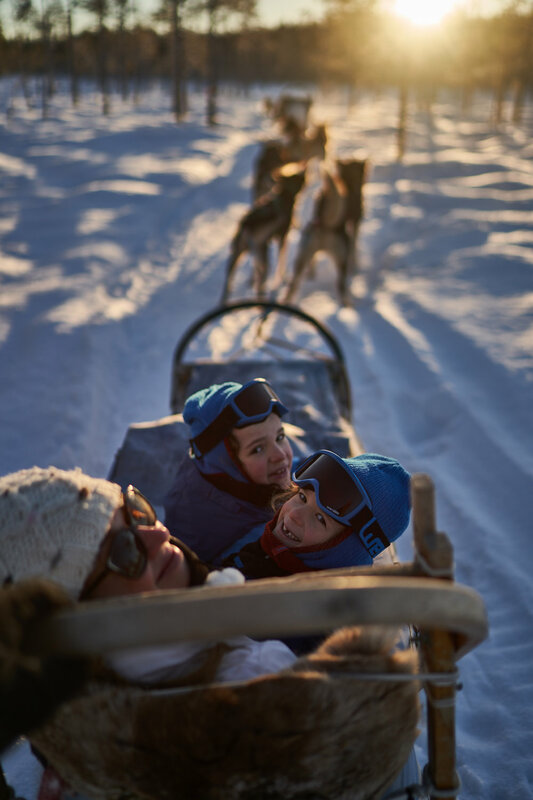 We got learned the basics on how to handle a sleigh, how to break, what to do when one of the dogs needs to go number one or two,… and then you let go of the anchor, the barking stops and all you hear is the sleigh carving through the snow. Magical! The landscape you’re sleighing through is surreal. Winter and snow give you access to parts you otherwise can’t set foot on. You float across frozen swamps, you slalom in between trees and cross the icy planes of the frozen lakes. All of this underneath that same low hanging sun which gives this extra touch to that magical atmosphere. 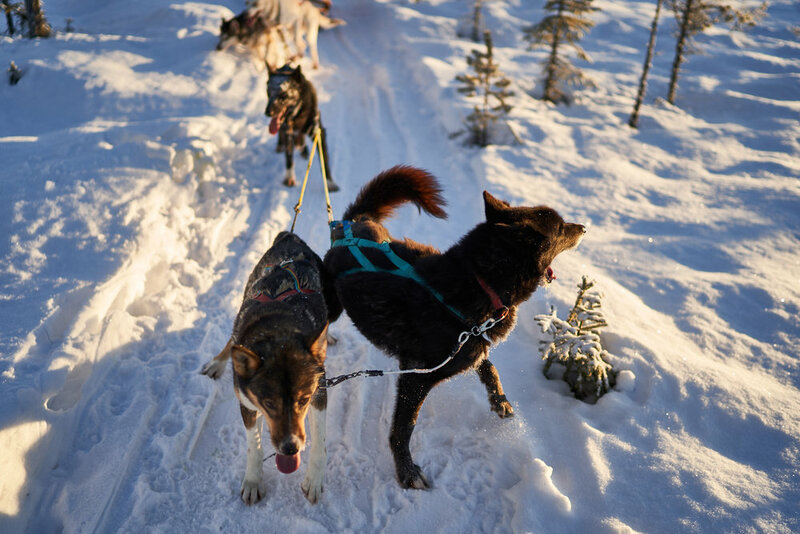 Although husky riding was a new experience for me, I immediately felt connected with the five dogs pulling the sled. You’d see them pull, bite in the snow to drink, you’re there when they suddenly stop to defecate… and time and time again you have to anticipate. The bond between man and animal is made quickly. 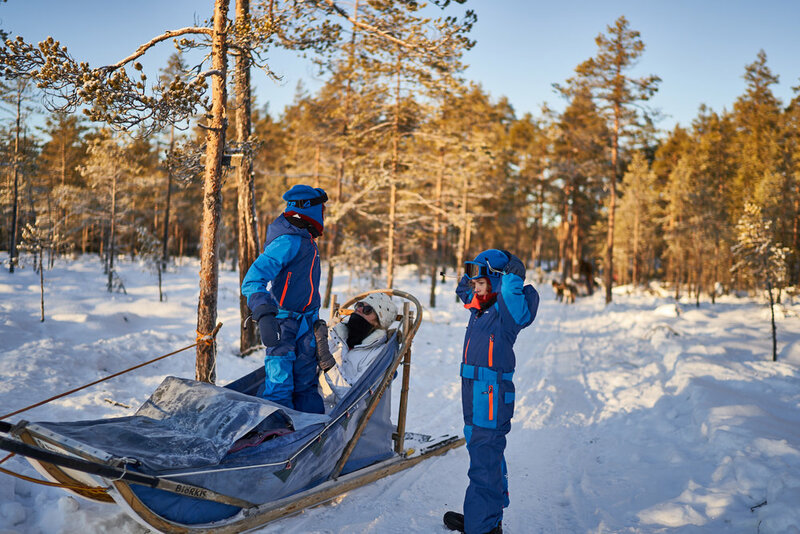 We sledded 17 kilometers through the landscape, without encountering any houses, telephone poles or people. All alone in the world, again! 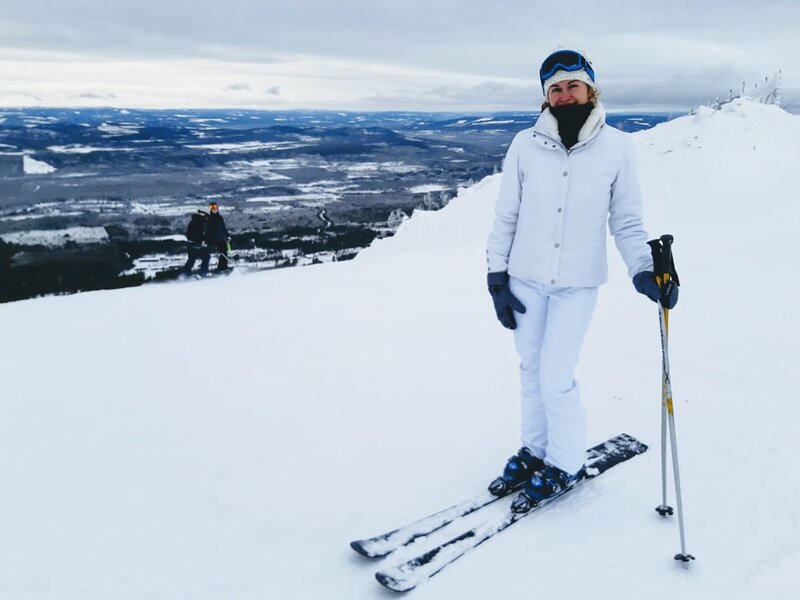 Liene, my amazing girlfriend and fantastic co-adventurer, is a huge ski fanatic. Me? Not so much. I love the mountains, snow, snowboarding and skiing. 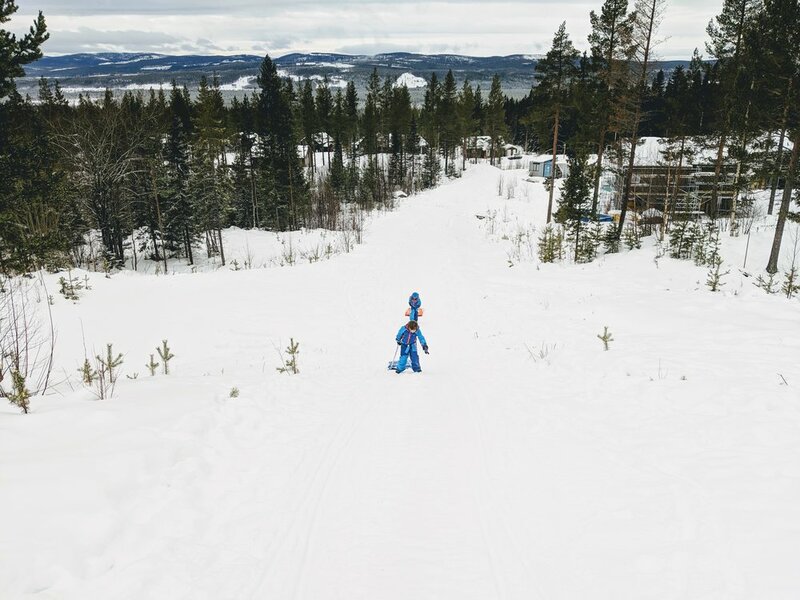 I don’t love après ski, crowds, drunk people, artificially high costs, long queues,… But since we found ourselves deep into Sweden and only a two hour drive away from the skiing area Björnrike (see map) it turned out to be no effort at all to head over there. Diger Sköls (see map), ‘cause daddy wants something as well! The road ahead was covered in snow, but still accessible. Marco told me we had to go the last kilometer by foot, because that part of the road was closed because of the snow. I didn’t ignore his advice and decided to, once we’d get there, park my car in the right direction to get back home. So I drove the snowy road for about 10 meters, to turn my car, put it in reverse and after barely a meter I felt like I was driving an ice rink. I got stuck in the snow, I tried every trick I knew: wiggling the steering wheel, trying different low gears, leaving pressure from the tires,… but nothing worked. The problem was that I had to drive backwards and I couldn’t use my different low gears – which only work when you’re moving forward. There’s only one gear to put the car in reverse. My tires did have deep grooves, but once the snow got squeezed in, they were as slippery as the ice beneath them. Slippery on slippery. I had to find a way to turn my car, luckily I had packed a winch. There weren’t a lot of anchor point nearby, so I had to find and work towards a new point time and time again. 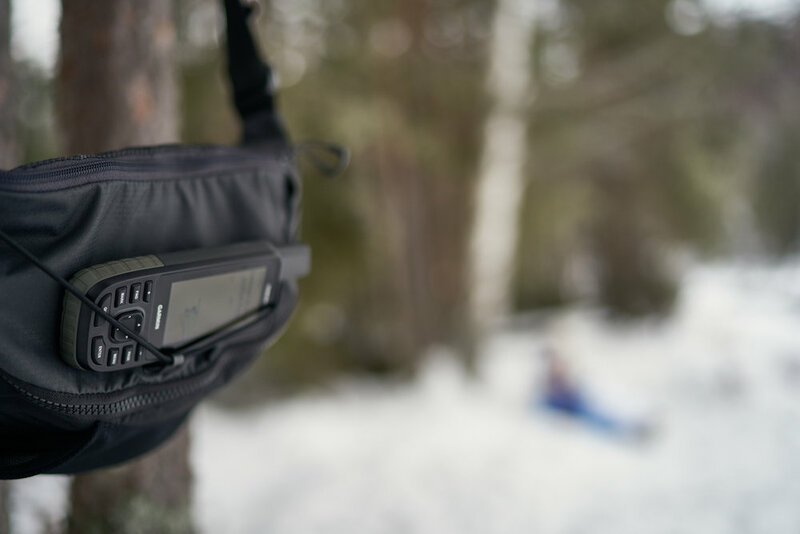 Luckily I’m always prepared – which doesn’t surprise anyone – and I had the right equipment with me. It might seem insignificant, but I got stuck only 10 meters away from the accessible part of the road. Problems are always lurking just around the corner… There wasn’t a moment I doubted we would get out, but I was extremely focused nonetheless. Because as it turns out, you’re still in a deserted area and if any help had to come, it wouldn’t arrive for quite some time. Something I was prepared for as well. I always pack a jug filled with water, a small gas fire to warm soup, coffee or oatmeal. Knowing this, I realised we would never get into real trouble. And as long as the engine of your car keeps running, you can stay warm as well. And if the situation would’ve gotten worse, I could’ve always called Marco. We both own a Network Radio (a walkie-talkie which uses the mobile phone network, without any limitations in distance) with Zello on it. So Marco was only a single push on a button away. Those Network Radio’s with Zello on are something we use all the time, by the way. During skiing or hiking to stay in touch or on the road, when Liene and the kids would be asleep and I had some time to kill. Anyway: once a Scout, always a Scout – I’m living by the words “be prepared”. Eventually we got out. During the celebration a tooth got knocked out, but some tears and a bit of blood in the snow later, we could all laugh again. We’re used to active vacations. This get-away was active as well, although in a different way. We did a lot and nothing at the same time. The snowy landscape really appealed to us in a unique way. Sitting at the shore of a frozen lake in a wintry desolation really makes you feel things. The vast forests suddenly appear in a giant open and white plain which gives extra space to your vision and mind. Hiking in such environments is truly a sight for sore eyes, even when the sun doesn’t shine. Also unbelievable is the fact you can spot signs of life everywhere. Elk, wolverines, birds,… during my nightly scooter trip with Marco we even spotted fresh tracks which belonged to a wolf. And even though you don’t see the wolf, discovering its tracks and realizing it is nearby, already is an experience on its own. Our relationship with Marco and Aafke is something beautiful as well. A chance encounter last summer, which turned into something really sincere and deep during this trip. 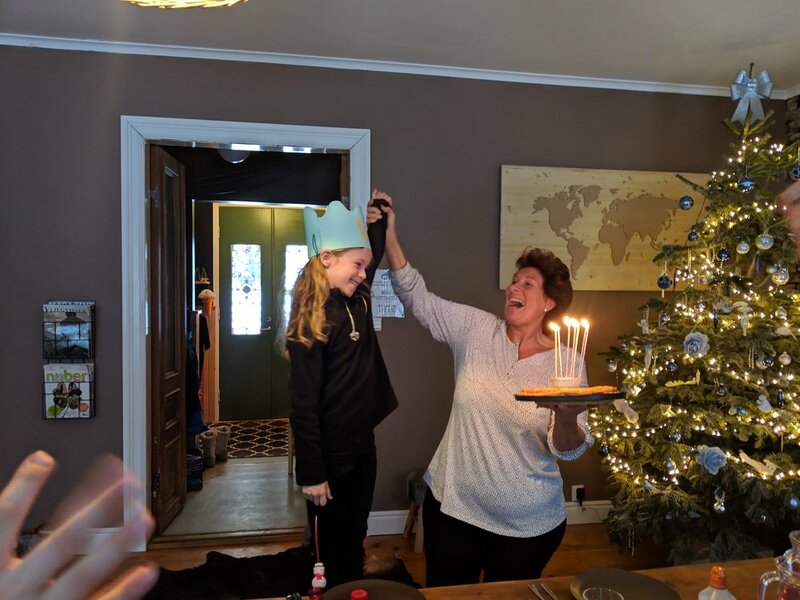 We had a lot of meals together and talked non-stop – especially Ellis and Liv and we had to try our hardest to get some words into the conversation as well. The food was deliciously tasty. Although we were so far away from our home, we felt right at home with Aafke and Marco. We couldn’t have expected this! Driving to wintry Sweden is a true enterprise. And then again, it is not. We arranged all of this only a week before we left, so it turned out to be low effort. All you need to do is to like being on the road and then time will fly. 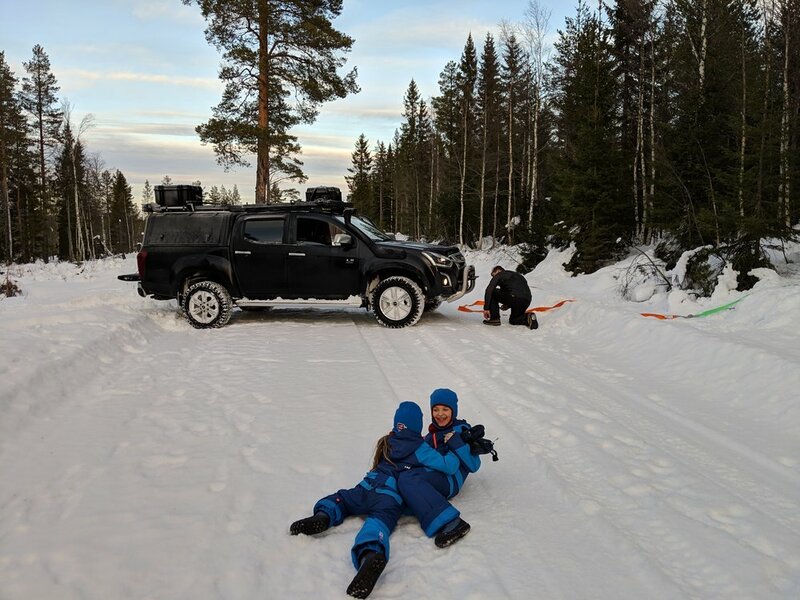 We drove a total of 4.100 kilometers, were away for 14 days of which we stayed eight in Sweden and spent six on the road – on our own, easy-going pace. When we left, we would leave between 9 and 10 a.m., and usually arrived at the next stop by 5 or 6 p.m. This gave us enough time to relax and discover the new environment. We prepared our lunch in the morning and arranged everything so we could drive the next day without taking more than one 20-minute break. And some a random pee-breaks. We really enjoyed our time together as a family. We were curious to find out how we would react on short days – the sun only rose by 9 a.m. and set again at 3 p.m. During the day we would often find the sky blue with a beautiful sun shining over us, which gave us enough energy. All this made us sleep in and get back inside at 3 p.m. to sit around the fireplace to do exactly the same. 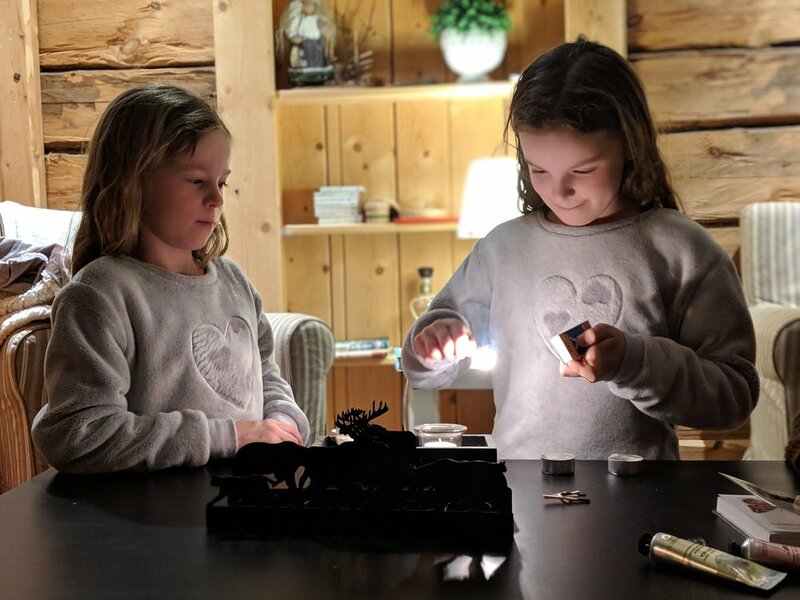 Playing board games, reading books, toying with our gadgets, editing pictures, planning hikes, dreaming of the good times to come and – from time to time – break up our daughters’ fights. All of this with a 100 percent focus on each other. Something we really needed, after Liene and I took a lot of trips abroad for work during fall. These short days forced a certain delightful routine upon us, which brought us closer together. You can’t put a price on relaxing, escaping the busy life and choosing quality and each other’s company. We fell in love with Sweden for the second time and we’re eager to discover more. Both Norway and Finland are getting in sight as well. The beauty and vastness of Scandinavia and especially Sweden left us impressed last summer. The contrast with the wintry landscapes is huge, but this experience felt wonderful as well. I even dare to say we developed a slight preference towards winter. But that might change again after next summer.